The first volumes of the "American Luther" we selected for publication were his best commentaries, then eight volumes of his Gospel and Epistle sermons and one volume of his best catechetical writings. These rich evangelical works introduced us to the real Luther, not the polemical, but the Gospel Luther. They contain the leaven of the faith, life and spirit of Protestantism. We now return to his spiritual commentaries on the Bible which are the foundation of all his writings. The more one reads Luther the greater he becomes as a student of the One Book. 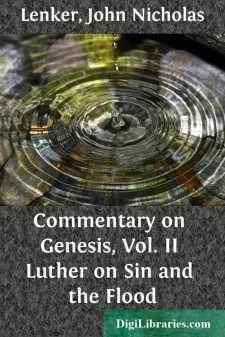 This, the second volume of Luther's great commentary on Genesis, appears now in English for the first time. It covers chapters four to nine inclusive of Genesis. The subjects discussed are: Cain's murder, his punishment, Cain's sons, Seth and his sons, the wickedness of the old world, the ark, Noah's obedience, the universal destruction, the salvation of Noah's family, his sacrifice, his blessing, the rainbow covenant, Noah's fall, Ham cursed and Shem and Japheth blessed. These great themes are discussed by Moses and Luther. They have vital relations to problems pertaining to the end of the modern world. Our hope and prayer are that God may use this volume to make the book of Genesis and the whole Old Testament a greater spiritual blessing to the Church and that it may serve the servants of God in these latter days in calling people to repentance, faith and prayer like Noah and Luther did. In his "Dear Genesis" Luther proved that the free Evangelical religion he taught was not new, but as old as the first book of the Bible, and that it does not consist in outward forms, organizations and pomp, but in true faith in Christ in our hearts and lives. Genesis contains the only historic records accessible of the first 2364 years of the 4004 years before Christ. It is worthy of study in our day as it was in the days of the Reformation. Luther advised no one should translate alone and he practiced what he taught. We have followed his rule and example. Pastor C. B. Gohdes of Baltimore translated chapter six and President Schaller of Milwaukee Theological Seminary, chapters five, seven, eight and nine. Inaccuracies may be due to the revision and editing, and not to the translators, for every good translation must be fluent and idiomatic, to secure which is the most difficult task. Pastor Gohdes also rendered valuable help in the final revision of parts. The translation of the analyses is by the undersigned. The few last pages of the first edition of volume one we revised and reprint in this volume in order to make the pages of each volume of our edition to correspond with the German and Latin volumes of the Erlangen edition. The paragraphs are numbered and the analyses given according to the old Walch edition.